Last weekend, as I was perusing my blog feed, I came across this post at Promenade Plantings that was part of a challenge given over at thekitchensgarden. The idea is to stand at your back door, patio, stoop, balcony, whatever your dwelling has to offer and snap pictures of what you see from there. Seemed like fun, so I have taken on the challenge. My back patio is a place we use a lot. When the weather is nice (which is most of year) it becomes an extension of our small house. We work, dine, play, entertain, relax, and were even married out there. The patio and the rest of the backyard is one of the main reasons we bought the house we live in. The above shot is looking straight back from our patio. The south edge of our property is shaded by a California Live Oak. 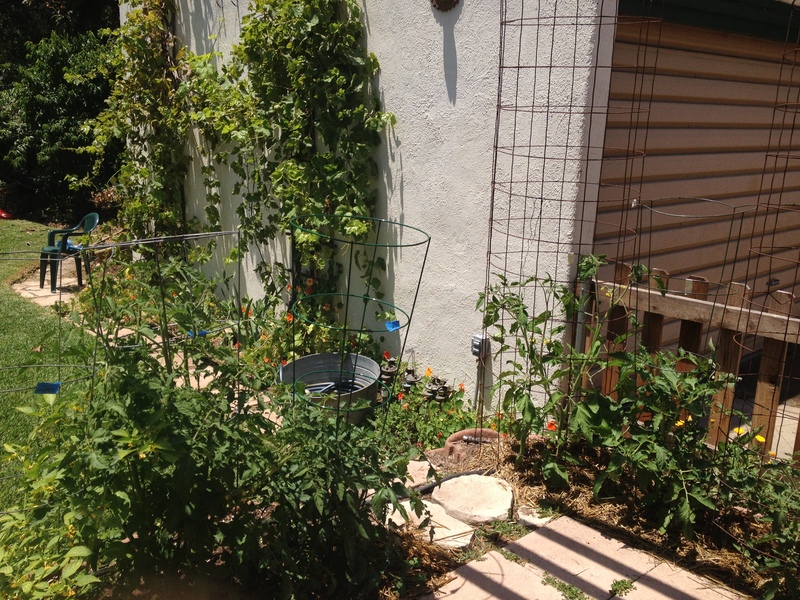 Just in front of it is our little orchard, one each of an apricot, plum, nectarine, and lemon tree. We have artichokes, irises and a sandbox back there as well. Coming up the west side of the lawn we have drought tolerant plants: Agapanthus, irises, golden poppies, and a few others. They all bloom throughout the spring and early summer. Turning west you run into our garage. 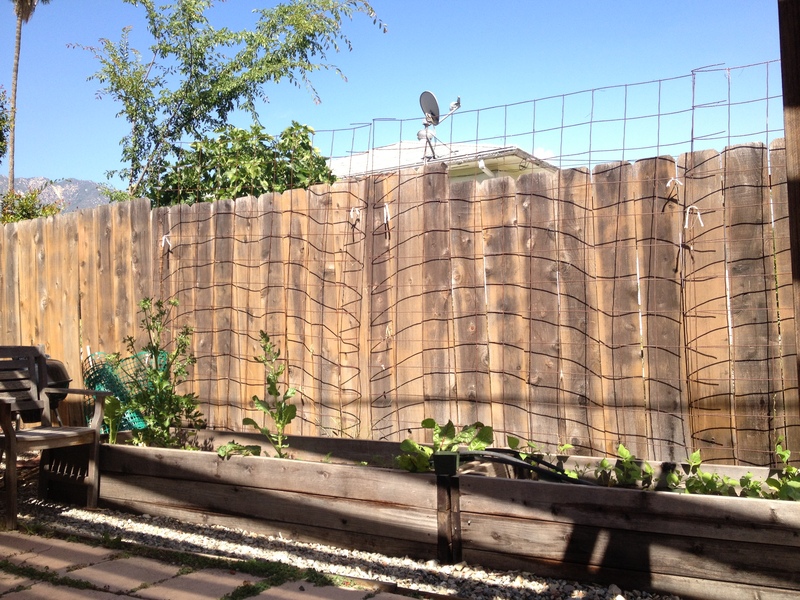 The wall is trellised for grapes, although they have a bad case of powdery mildew that I haven’t had time to mitigate. The vines have been there for three years and we haven’t enjoyed one grape. Along the edge of our patio I am growing tomatoes this year and they seem to be liking the new spot very much! Swinging around north you see the back stoop coming off our kitchen. It is usually littered with things needing to be returned inside. Certain times of the year our kitchen trash can lives out there because we can’t keep the ants out of it. We’d rather them enjoy their trash outside than inside. 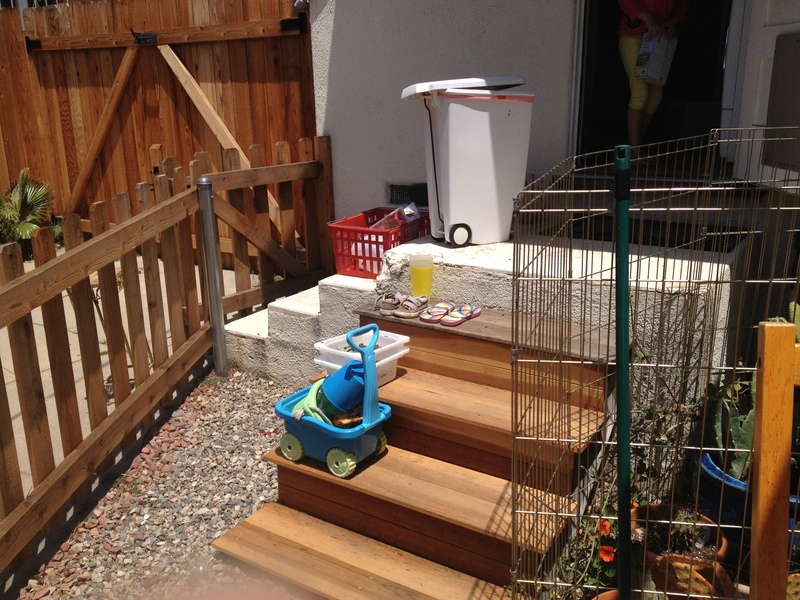 This is the eastern edge of our patio, just a short distance from the paving stones to the fence. 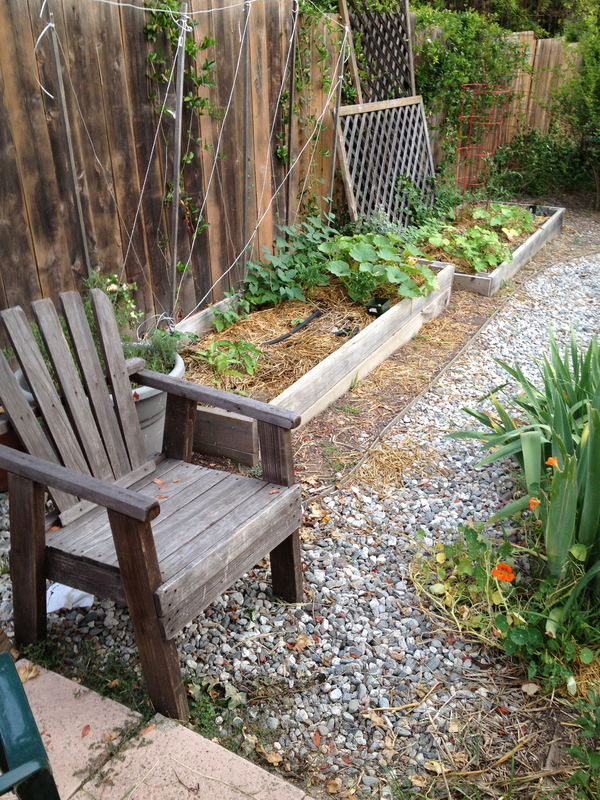 I have a couple of raised beds here that are trellised for beans, squash, peas, and cucumbers. You can see a peak of the San Gabriel Mountains just over the top of the fence. Looking down the easter side of the yard, you find more raised garden beds and a path that leads to a nice bench that we never sit in. We have put a lot of work into our backyard, more than the inside of the house. We have built garden beds, laid down tons of mulch, hacked and trimmed and hacked some more (we have a fence full of ivy behind the garage). If I am being completely honest our yard is often littered with sand buckets, small plastic animals, balls, children’s shoes kicked off in mid play, gardening tools, the hose strewn about rarely coiled into its place. 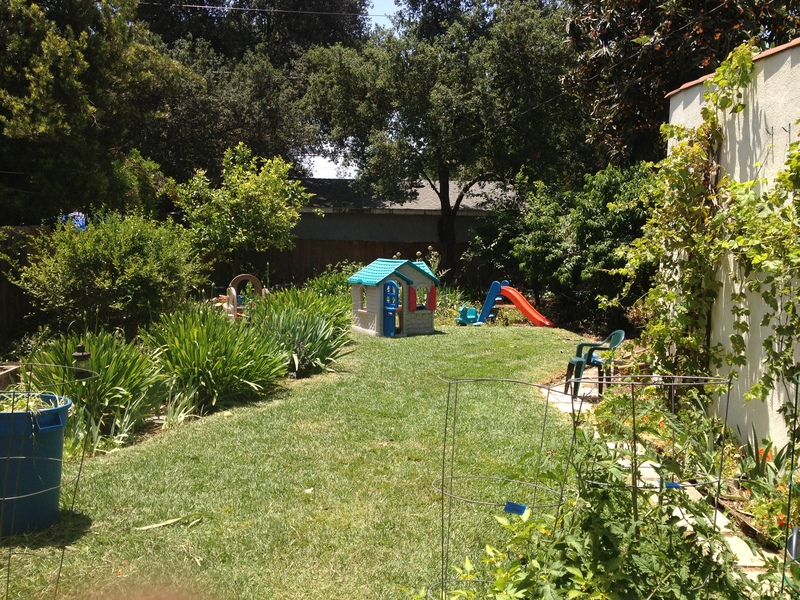 It is kind of “shaggy” and overgrown, and we love it! Thank you so much. We do spend so much time outside and we have double glass doors that look out onto the backyard too. I don’t see how it could be any other way. With the 1200 things that need to happen in a day, picking up the toys outside is just not high on the list. We do a careful combing of our lawn before mowing. We are on the look out for the rocks that my son dumps there and the little plastic animals that are usually hiding out and forgotten among the grass blades. I too loved the last paragraph, your garden is a beautiful space, much loved and lived in – just as a garden should be! And thank you for the kind mention, I’ve loved seeing – literally – into everyones worlds 🙂 Happy days.